Yes, it's Superman - strange visitor from another planet who came to Earth with powers and abilities far beyond those of mortal men. Superman - who can change the course of mighty rivers, bend steel with his bare hands, and who, disguised as Clark Kent, mild mannered reporter for a great metropolitan newspaper, fights the never ending battle for Truth, Justice and the American Way. Superman is a great American hero and is a perfect choice for a birthday party theme. You'll find Superman birthday party ideas including games, activities, decorations, favors and much more. Set up an obstacle course that looks like a city using large cardboard boxes and any items you have that kids could jump over, climb through or have to go over or under. Decorate the boxes to look like tall buildings by drawing windows onto them and stacking them on top of each other, place string in a criss cross shape that they must crawl through, use trampolines that they have to jump on and and sawhorses to crawl under. Play this game individually by timing them with a stopwatch or as teams against each other in a relay race. Relay race where party guests have to change into two sets of clothes the fastest. Gather two sets of these items: Old suit coat and suit pants (check Goodwill stores), new socks, men's dress shoes, briefcase, sunglasses, tie, and a newspaper ... and two sets of these items: cape, new red socks, large blue long sleeve t-shirt, Superman Emblem (make from construction paper or print off the computer). Set the Clark Kent items in one pile and the Superman items across the game area in another area. Divide guests into two teams and one by one the kids have to dress up in the Clark Kent items, run to the Superman items and change ... run back to their team and tag in ... then run back to the other side of the room and change back into the Clark Kent clothes and finally run to their team so that the next child in line can go. For more fun decorate large appliance boxes to look like telephone booths and make the kids change into the Superman clothes inside it. See our long list of fun party games for more ideas for a Superman Birthday Party. Print out the Superman "S" emblem, cut out and glue onto solid blue note cards. Glue a piece of red material or felt onto blue note cards to look like a Superman cape. Make the invitation look like a Newspaper with the information as the Headline. Name the newspaper "The Daily Planet". Have articles on "Truth, Justice and the American Way" and the "Man of Steel". Make invitations with "It's a bird .... It's a plane ... " on the outside and on the inside "It's ______'s Birthday Party!" 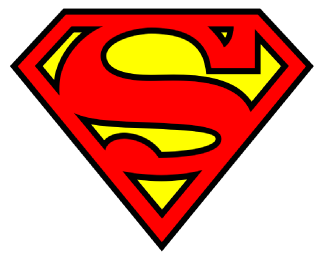 Superman is mainly blue with some red (cape and "S" emblem) and touches of yellow. Leading into the party area make signs from poster board (or print on the computer) and attach to stakes in the ground that say ... "It's a bird" and "It's a plane" ... one word per sign. Decorate the party table in blue and red with touches of yellow. Red and blue helium balloons can be tied to the chairs or left to float on the ceiling so the kids can play with them during the party. Attach red fabric to the backs of the chairs of the party table to look like Superman capes. Set up a bounce house so the guests can leap and fly like Superman. Make Superman capes for the guests. If you don't know how to sew simply hot glue wide ribbon or rope to rectangles of red fabric or pillow cases. Decorate party bags to look like city buildings by drawing small windows on them.... then let the Supermen jump over them.